Does your child sometimes scratch behind his ears? Does he stare at the moon longingly? Does he get an unfulfillable hunger each month? Have you ever thought your child could be a werewolf? If you’ve never considered it before, maybe it’s time to take a closer look at your child’s habits! If they do demonstrate some of these characteristics, then it’s a great time to help their external look match how they feel inside. This kids werewolf costume is a great way to give them the look they want this Halloween! Not only will they look like the intimidating werewolf that they feel like inside, but they’ll also be ready to show off their look to everyone in the neighborhood. 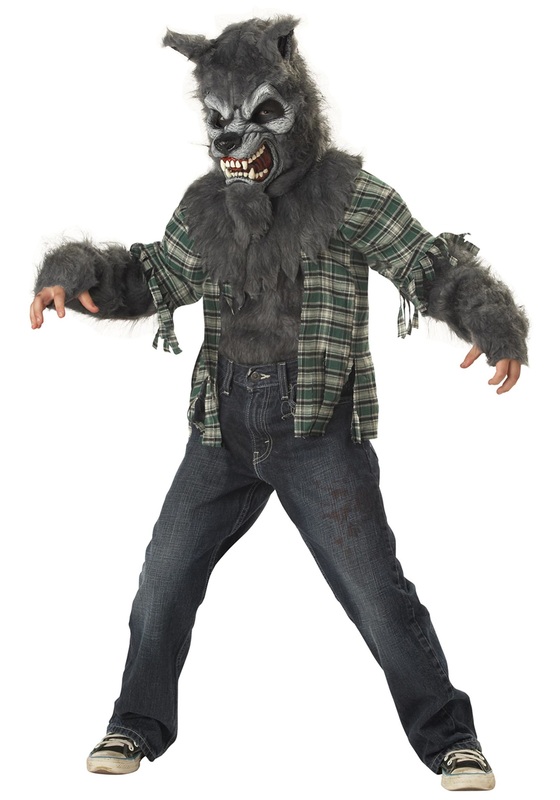 Howl at the moon all night long in this Child Werewolf Costume, and prove that the folk tales are true! This costume comes with the essential pieces you need to become a werewolf this Halloween. The look starts with a tattered white, black, and green plaid shirt with grey faux fur coming through the holes of the shirt. The padded shoulders of the shirt give it extra bulk to make you even more intimidating when you head out for the night. The crowning jewel of this costume, however, is the realistic werewolf mask that is covered in grey faux fur and has a detailed latex face. Transform from your normal self to a frightful Halloween creature by simply adding this costume to your own jeans and hiking boots or sneakers.